2017 marks the 100th anniversary of the birthday of the 35th President of the United States - John Fitzgerald Kennedy. 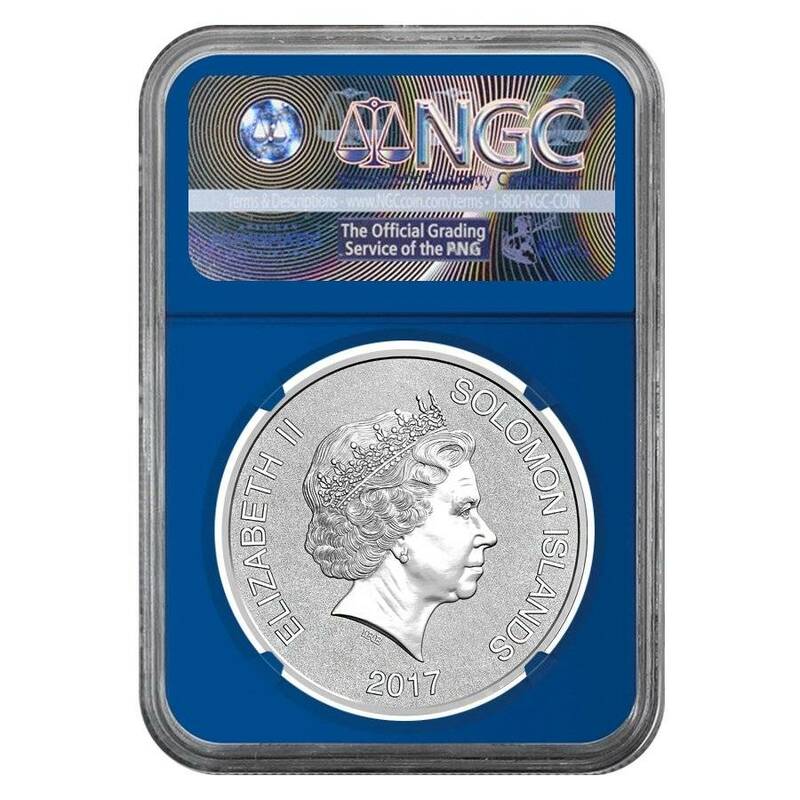 The Royal Australian Mint and Bullion Exchanges are highly pleased to offer this outstanding 2017 1 oz Silver JFK Solomon Islands NGC MS 70 FDOI First Day of Issue. This stunning $1 coin is legal tender of the Solomon Islands. This coin is made from .999 silver with a frosted finish, has a limited mintage of 15,000 pieces, and an impressive coin diameter of 40.00 mm, allowing every detail to be perfectly displayed. The coin designer Steven Stojanovic, a well-known illustrator from the Royal Australian Mint was inspired by Kennedy’s act of courage and presented it in his artwork. This silver coin was graded by NGC to verify the weight and purity within its first day of release and was certified as Mint State 70 - A fully struck coin with no imperfections at 5x magnification. The coin’s obverse features the PT-109 boat and the portrait of John F. Kennedy completed with the inscriptions: “1917-2017,” “ONE DOLLAR,” and ”JOHN F. KENNEDY.” The coin reverse showcases the effigy of Her Majesty Queen Elizabeth II, completed with the inscriptions: “2017”, “SOLOMON ISLANDS”, “ELIZABETH II”. To enhance the presentation of this outstanding release, Bullion Exchanges offers the coin in a special NGC JFK Ask Not Label Blue. Made from .999 pure silver with a weight of 1 troy ounce. The exclusive release from the Royal Australian Mint. Limited mintage - 15,000 coins. Coin comes in special JFK Ask Not Label Blue. NGC MS 70 First Day of Issue - A fully struck coin with no imperfections at 5x magnification. First Day of Issue - Coin was received by NGC within one day of its release. Obverse: Features the portrait of young John F. Kennedy, a boat PT-109, completed with the inscriptions: ”1 dollar”, “1917-2017”, “John F. Kennedy”. Reverse: Bears the effigy of Her Majesty Queen Elizabeth II, completed with the inscriptions: “2017”, “SOLOMON ISLANDS”, “ELIZABETH II”. With Bullion Exchanges, you can be sure you will find only high-quality bullion coins with impeccable designs. Place your order today and our team will make sure it will be delicately wrapped and securely packaged. If you have any questions, call us by phone at 800.852.6884 or write us a message, we will be happy to assist you. 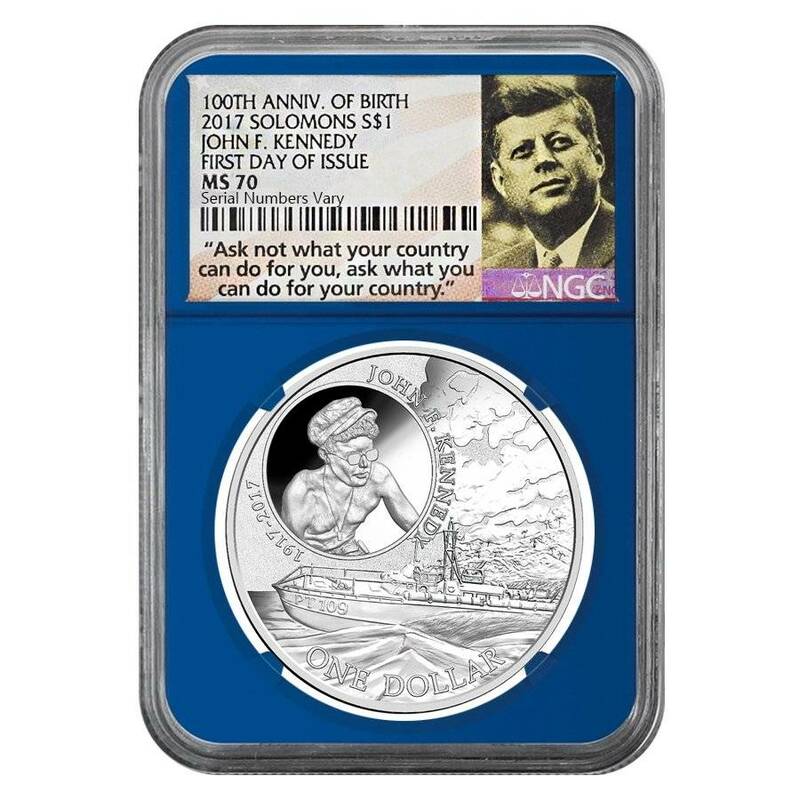 Get this astounding 2017 1 oz Silver JFK Solomon Islands NGC MS 70 FDOI today! With this purchase, you earn 91 Bullionaire Bucks 91 BB = $0.09. We currently have 123 of this item in stock. For every $1 spend, you will earn 1 Bullionaire Buck which is equivalent to $0.001 off a future purchase. 91 BB = $0.09.